If you use Google Chrome and you haven't disabled the built-in PDF plugin, you can now open PDF attachments from Gmail using your browser's viewer. Just click "View" next to the attachment and you'll notice that the PDF file opens faster and it looks much better. If you disable the plugin or you use a different browser, Gmail continues to open PDF attachments using the Google Docs Viewer. Maybe Gmail should also detect Adobe Reader's plugin and use it instead of the online PDF viewer. Google Apps blog informs that this feature will be available in Google Apps next week. You can get it faster by enabling "pre-release features" in the Administrator Control Panel. Adobe Reader plugin should be avoided like plague! I do think that Chrome shows you the option to switch to it when it opens in the built-in viewer. The problem with this change is that previously, it was possible to save attached PDFs into Google Docs by using the web-based viewer, and clicking the "Save in Google Docs" link there. 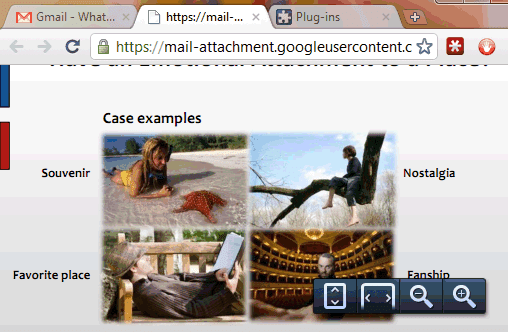 Now, there's no way to achieve this same functionality from within Gmail, when using the Chrome PDF viewer. A link is needed within Gmail itself to provide this functionality. Actually, there is a way to do that. Right-click on the "View" link, copy it, paste the URL in the address bar and replace "view=att" with "view=gvatt". Chrome's PDF viewer uses code from Foxit Reader. Adobe Reader has improved a lot lately, it's fast and it works well with Chrome. The latest version sandboxes the renderer and includes auto-update, just like Chrome. It's probably the best PDF reader for Windows, especially if you need advanced features. Chrome's plugin is lightweight and doesn't require additional software, but there are a lot of useful missing features: page thumbnails, jumping to a page, rotating pages, annotations, password-protected PDF files etc. I always save PDFs to my PC first because if they are too big, they crash the browser. Is there anyway to open pdf documents stored in Google Docs with the integrated Chrome viewer? I find it much faster and better viewer than the gdocs viewer. Try this workaround: open the file using Google Docs Viewer, click File/Print and close the printing dialog. I just wish there were a way to jump to a page! It drives me crazy. Hi, please implement function like jump to page and show somewere info about sites (how many sites the pdf have and so on...) - all this fuction should be like current function (show when hover mouse). And it will be great, if people can select an option, that the PDF open in new window without border - just whole PDF. The 3 buttons (close, max, min) will be inside of the right bottom corrner (show when hover). That works to get it back to save the attachment in Google Apps but it seems like a wonky workaround. I don't see reason for the change. Is there maybe a gadget or plugin to automatically enable the old version? I'm having a problem sending pdf's using the email pdf button from chrome. It used to work and now just crashes the viewer.